Straight leg jeans are on trend this season. Just like your other types of jeans, these will also go with so many of your wardrobe favorites. The straight leg jeans are perfect for elongating your silhouette – which is why they are a great choice for most figures. Everybody’s wearing and talking about skinny jeans and bootleg cut jeans and now many are left wondering– are straight leg jeans still relevant? Here are some of the reasons why you need to pick straight leg jeans with your outfit over the rest. Straight leg jeans flatter boyish figures. The style will simply give your boyish figure some shape giving the illusion of having curves. Tuck in your blouse to give your entire look more shape. Anyone (ANYONE!) can wear them. Since the straight leg jeans are straight from the knees down, it gives an illusion of skinny jeans but is more forgiving than the actual skinny jeans. It’s comfortable to wear but not baggy. Find your perfect pair of straight leg jeans by looking closely at the silhouette of the pants. It should be slim, not tight, around the thighs and hips. It’s perfect for showing off your shoes. You can easily tuck your pants into your boots or even cuff it to show off your favorite footwear. Show off your stylish pair of boots, straight leg denim works better than boot cut since the straight leg won’t cover your shoes. Straight leg styles show off most shoe styles. Ladies with curvier shapes can pull this look off, too. You don’t even have to be worried about looking too wide because wearing high-heeled boots paired with a tunic blouse with your straight leg jeans will balance out your proportions. Straight leg jeans are versatile. These jeans offer more versatility whether you pair it with high heeled pumps, ankle boots, flats, sneakers and many more. You can pair it with either a flowy blouse or fitted tops without worrying about looking baggy. Straight leg jeans are more modern-looking. These are the go-to of many style stars and celebrities that can easily be dressed up or dress down. 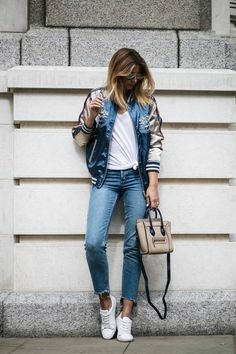 Whatever outfit you pull together with your straight leg jeans, you’ll surely be able to create a chic and unique look.